I just got a Zodiac Super SeaWolf and I though I would review it for anyone interested in one mean dive watch. For anyone unfamiliar with this watch it is a massive professional diver’s watch, water resistant to 1000 meters (approximately 3,330 feet) and allegedly endorsed by the U.S. Navy SEALS. CASE: This watch is massive. The case measures 43mm, 46mm to the end of the crown. It is 45mm long and an impressive 15mm thick. It weighs a whopping 6.85 oz. or around 200 grams. It is a large cushion shape that is reminiscent of the shape of early 70’s Omega Constellations. There is a large crown protector for the signed screw down crown and, of course, a screwed back. The back is engraved with the Zodiac symbol and the following: Stainless Steel, Swiss Made, Water resistant 1000 meters tested. The engraving is decent, a little rough on the edges. It may be a high pressure stamp. The entire watch is finished in a bead blasted S.S. finish that is satiny to touch and completely anti-reflective. DIAL: The dial is black. There are bright orange rectangular markers at all points except 3 where there is a date and 6, 9 and 12 where the markers are larger and more of a triangular shape. All markers are tritium filled and light up quite well. Also, between 1and 2, 4 and 5, 7 and 8 and 10 and 11 there are mathematical fractions which I suppose are decompression ratios. 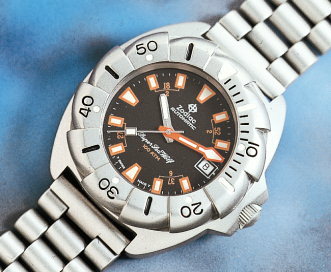 The dial is signed Zodiac Automatic and Super SeaWolf 100 ATM. It is very legible as the bright orange markers provide an excellent contrast with the black of the dial. The dial measures about 29mm, a bit small for such a massive case but more than adequate. HANDS: This watch was designed with serious diving in mind and the hands reflect that. The minute hand is huge and dwarfs the hour hand (minutes, logically, are much more relevant when diving). It is a bright orange arrow and filled almost completely with tritium. The hour hand is a chrome baton, also tritium filled. The second hand is a very slim baton, pointed at the end, with a good sized rectangular tritium filled section near the tip. All hands light up quite well (especially the Minute hand) and are very visible in the dark. You can watch the seconds elapse in total darkness. The minutes hand truly stands out. I guarantee that you will never not know the minutes with this watch. BEZEL: This watch has a very unique bezel. It is shaped like a saw blade. Besides looking quite mean, it is also very functional and provides excellent grip under all conditions and even with gloves (I tried), it turns easily as well. Compared to my Bond Seamaster it is magic, although not as nicely styled (i.e. not very subtle). Like the dial, the bezel was purpose designed for serious diving. It contains a HUGE tritium filled triangular section at the 0 minute start point, followed by large portions of tritium at 5 minutes and 15. The numbers 10, 20, 30, 40 and 50 are engraved deeply and colored black as are hash marks at 5 minute intervals. All numbers have a tritium dot and the bezel is graduated in minutes from 0 to 15. The bezel itself stands nearly 5 mm high! CRYSTAL: The crystal is sapphire. It is flat but well protected by the bezel. It lacks an anti-reflective coating which I think it should have as a “serious” dive watch. However, you won’t scratch it through ordinary use, but you will scratch the bezel (I already have). BRACELET: I bought my Zodiac second hand and thus only got the bracelet. It also comes with rubber straps and a changing tool if you buy it new as well as a carry case and, I suppose, nice instructions. The bracelet is the only disappointing feature of the watch. It is a Rolex President style with three rows of half circular links, flat on the bottom and longer links in the middle row. While it has nice “heft”, it is kind of insubstantial compared to the rest of the watch, it feels cheap. Why Zodiac scrimped here I don’t know. Ditto for the clasp. It is a signed fold over fliplock with a wetsuit extension (easy to open and use). It is obviously a stamped piece and looks like it could be broken if stressed. Not nearly as well made or designed as the clasp on my Bond Seamaster. Like the case, the bracelet is finished in a bead blasted S.S. I will say that it is very comfortable, no pulled hairs. However, I may replace it with a soft rubber strap like a Euroband. MOVEMENT: I don’t know what movement this watch is equipped with. My guess is ETA, most likely 2824-2. It has that gritty ETA rotor sound and the same type of resistance to hand winding both my Hamilton Viewmatic and Fortis Pilot’s have and I know they are 2824’s. It is certainly high beat judging from the tickaticka sound and second hand sweep. It is also extremely accurate. It gained 1 second in 24 hours. What more can I say? I don’t think it is a certified chronometer but it is more accurate than my aforementioned Bond Seamaster which is certified. OVERALL: I rate this watch highly as an everyday clunker or serious sports piece. It has an overall feel of quality, like the way a door closes on an S Class Benz, hefty like a bank vault. If the bracelet were of the same ilk as the rest of the watch I would be even happier. It is not for the timid. It is huge and it looks huge. If it had a bigger dial it might hang with the Luminor Panerai as far as massive dive watch King of the Hill. Of course you CAN get a Zodiac, try getting a Panerai! It is HEAVY, Royal Oak heavy. It feels like you have a car battery on your wrist so if you don’t like heavy, look elsewhere. I like it because it looks serious, as if it could really stand some abuse. Zodiac claims it is indestructible and I don’t doubt it. The bezel looks like it could be employed as a weapon in short order, or you could just bludgeon somebody with the case! Overall it is very functional, has an awesome depth rating and is very “manly”. If this type of watch appeals to you I highly recommend the Zodiac Super SeaWolf and remember as William Massena put it, “Size Does Matter”!!! !